Sorry for my erratic appearances here in the last month or so many things have been occupying my time recently & it makes it more difficult to comment on peoples photos & blogs – let alone writing blogs myself! If I don’t seem to be around as much as I used to be don’t worry because I’m still here but the title I’ve chosen for this blog really explains a lot as well! Flower Mod refers to me have become a Mod on about half a dozen flower groups on Flickr! I have to look at & approve, or otherwise, 100’s of photos daily! Fortunately the great majority of photos are great photos of flowers – which makes it a lot more interesting! Before I finish I’m going to include a photo of my Amaryllis on our living room table & another of what our balcony looks like at present. Previous post: 'Pinky' or not 'Pinky'? Wow that briggtens up that area I bet the locals around your area love and appreciate your displays your Amaryllis are wonderful. I am using empty plastic cordial bottles on my balcony this year. Have 7 out there, always full of water. Twice daily just go and give the pots a drink. The compost is in black plastic bags this year. Contains the correct amount for a daily drink. Just a little drains out. Much easier than heaving watering cans about. 3d I hope so, too! Though in all fairness I plant for myself not for the neighbours but if they like what I plant then we are all happy! Diane, like you, for years I kept 2lt plastic bottles filled with water on the balcony to water my plants instead of traipsing backwards & forwards through the living room every time I needed to water my plants! I haven't started doing it this year yet as I wasn't expecting this hot weather to last more than a couple of days. Also when it gets so hot like this the water can get VERY HOT indeed! I wouldn't like to kill my plants by giving them HOT water! In a couple of weeks when the tomato plants give some shade I'll put the bottles out again. BTW, I've been using the same bottles for the last 17-18 years!!! 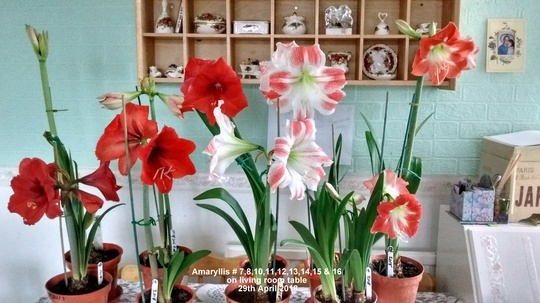 Lovely Amaryllis and your balcony is a sight to behold. green shoot in my Amaryllis bulb a drink. Its just quietly sitting behind the greenhouse waiting to grow for Christmas. Now, where did I put the instructions ? 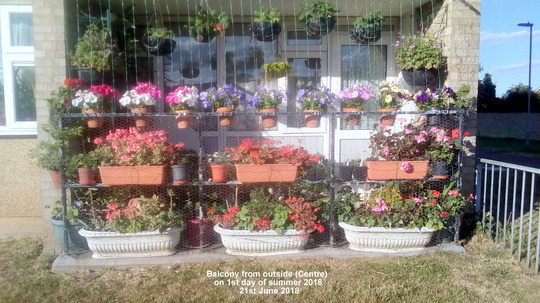 They look absolutely wonderful, the indoors and the outdoors, lucky neighbours, is all I can add..
Dear Balcony next time you have a birthday ask your son to buy you large deep plant saucers. The potting soil now in the heat is like cinders, plants need moisture to survive. Without them water runs through the pots and is lost. These large deep plant saucers are as if made of gold ! Every drop goes into the root ball and saves the plant. Thanks, Diane, but I have always used plates & saucers under all my plant pots! Except for the three big troughs everything else has its own plate or saucer. Even so some of the plants need watering a couple of times a day in this excessive heat of late. I'm starting to get a little worried about water! If this hot dry weather carries on through most of July it will make watering my 30 plants of tomato a very difficult task indeed! I just hope we don't have water shortages in what remains of the summer this year. I have some of those black trays that are meant to go on greenhouse staging (I think) and if the plants are stood in them and well watered all the spare water collects in the tray and is absorbed later when needed. Its easier than using individual saucers. Balcony the tomatoes from the seeds you sent me are doing well in them and lots of fruit setting in the first ones. I guess it works like ring culture if you feed the pots and water the tray too. Was going to PM you but hopefully you'll see this! I have the trays but is like Hywel's oven just now ! ok for Cactii. Give hem a soak in the bucket every 6 weeks hoping they will flower - eventually. I'm glad your tomatoes, too, are growing well, Diane! Mine are growing a couple of inches a day! I've never seen tomatoes grow so fast before! I have to wind them around the strings they are attached to to keep them from bending over with all the new growth they are putting on. Would you believe they have grown by about a foot a week since I planted them out at the beginning of June?! The growing tip of one plant can now look me straight in the eye! I'm 5ft 6in & the plant was about 4in high when I planted it out! The Red Robin tomatoes you sent me are full of fruit - (still green)doing brilliantly! thank you again! That's alright! I'm so glad they are doing so well for you! 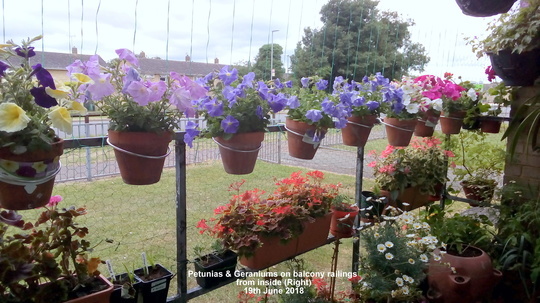 I have a dozen plants of 'Red Robin' in 3 hanging baskets as well as 3 more plants in a pot on the balcony floor. Like yours, mine are also full of little green toms! You needn't thank me, after all, it's you who has done all the work, I only put some seeds in an envelope & sent them to you!